The Annual Spanish Colonial Art Show is a great chance to introduce children to an authentic 1830’s Rendezvous – with mountain man competitions of tomahawk toss, a black powder shoot, a burro race, and more. Entertainment includes face-painting and an interactive area of wampum bead crafting for kids own necklaces etc. 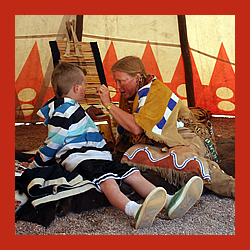 Educational activities and displays are included to introduce youngsters to the ways of the early West.